Architecture answers the basic needs of people and manifests the characters of society. It connects our consciousness to the reality settings that interplays with the presence and the transience. The image of it suggests the daily matters that evidences the passage of time. It is the background of our narratives of life. To most extent, practising architecture is a journey of self-recognition. The thesis examines the philosophical meanings of architecture. It explores the translation of perception and experience to spatial settings, through design and curation, to reveal the meaning of the space. It defines architecture as the monument of the present which amplifies the current conditions of the neighbourhoods to address interacting social activities. The study explores a narrative technique, parallel narrative, into spatial design theory. It transforms the background of daily matters: incidents, encounters, and the transiences that define our memories and identities as the foreground to reveal the notion of presence and self-awareness. Modern city development and urban lifestyle prompted a discussion of the underlying mental health issues which avert us from meaningful social encounters. As the modern world favours commercialisation, a new universal need that motivates the human desires and behaviour. When one or more of our core needs go unmet, a state of psychological discomfort and insecurity ensues. Materialism represents a pervasive value in contemporary society, a common route to reduce this psychological angst is to assuage our insecurities through material objects. As our lives are being filled with meaningless objects, we begin to lose the ability to extract meaning and memories implanted within the things that truly mean something and define who we are and not who we are trying to be. What defined Madrid as a site? Madrid is arguably less influential when compares to other Spanish cities like Barcelona and Valencia, regarding art, culture and history, as a capital city, the character is promoted as a mixture of Spanish culture but Madrid itself. In the contemporary society, the image of the city has slowly become a product of consumerism and materialism that increasingly distinct from the daily and living context. Study development questions the necessity of reestablishing authentic Madrid identity. Since the millennium, the city has undergone gentrification due to the intensive immigration flow. (Please refer to the project short film for more details) The new population changes the local culture that contrasts with the city’s given character. The scenario suggests an architectural response to Madrid’s city identity, which further inspires a discussion of the meaning of space and architecture. How important was the medium of the movie? What defined the various elements and spaces you choose to capture and juxtapose as a sequence? 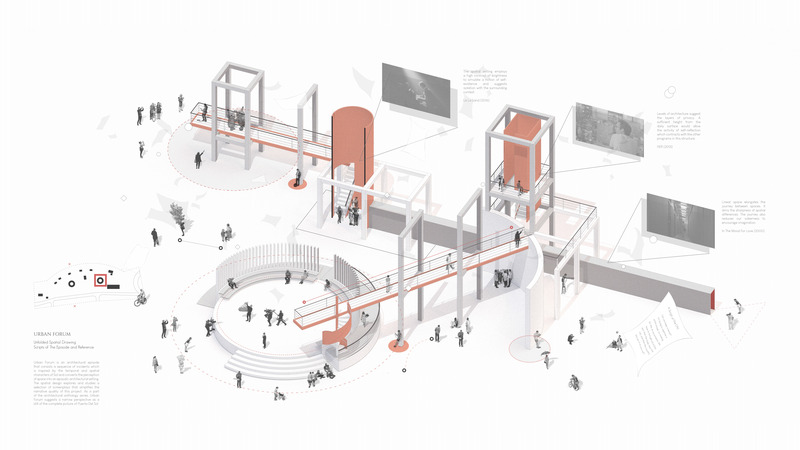 The project explores the meaning of space and architecture that it argues incidents within the daily matters associates to our lives narratives which fosters the notion of familiarity. These social encounters are the identity of a city; where architecture is the ‘script’ that able the access to these hidden episodes lie beneath the visual context. The movie reinforces the manifesto with a sharp contrast between visual content and a series of voiceover interviews to reveals that the notion of familiarity will reshape our perception of space. In other words, if the audience switches off the ‘script’, the short film will become a set of meaningless montages. 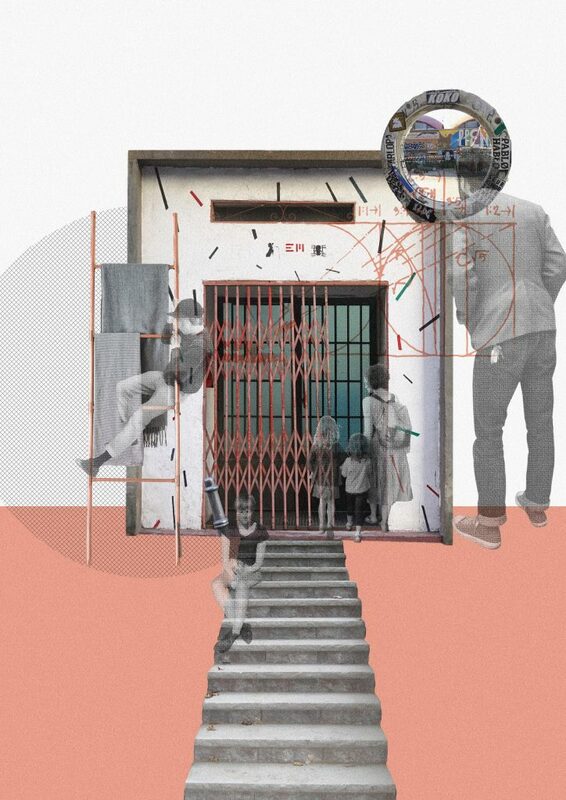 The development follows the line of enquiry to translate my encounters within the city, as an architect and a film director of the project, to delivery this experiential concept. The inspiration is from Spike Jonze’s early work, ‘Being John Malkovich’, that the concept of a portal to enable the access to my narrative and see the world from my eyes. What is for you the relationship between architecture and the moving image? Architecture answers the basic needs of people and manifests the characters of society. It connects our consciousness to the reality settings that interplays with the presence and the transience. The image of it suggests the daily matters that evidences the passage of time. It is the background of the loosely interlinked stories within the city. While the moving image is the episode, or memory, itself, to most extent, practising architecture is a journey of self-recognition. What defined the selection of mediums through which you explore and develop the thesis? how is each one instrumental in revealing specific aspects? Instead of a top-down decision, it is rather a place-making mindset to address the character of space. The development focuses on Puerta del Sol as an example to reveals this experiential idea as it is the intersection of the lines of enquiry. 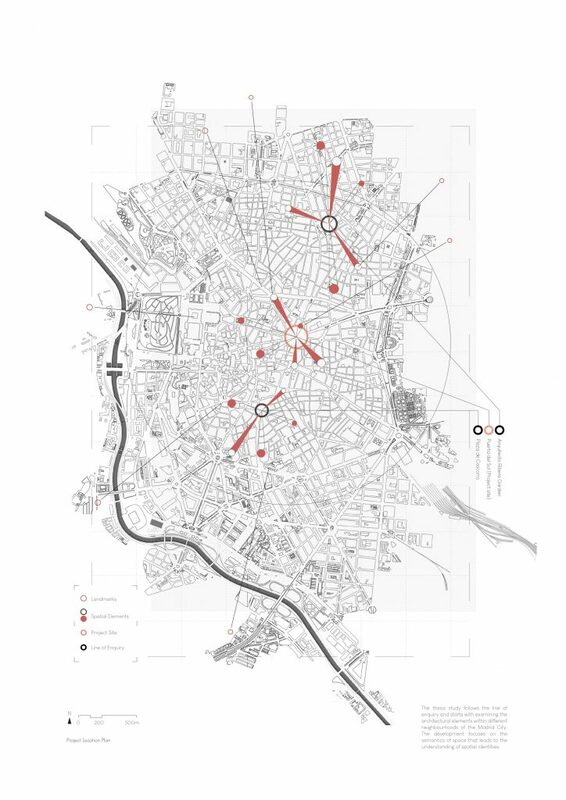 The analysis covers different aspects of the place with events, movement, the transience and building grid etc., which the data are superimposed into a secret map that distinct from the visual settings but presents our perception of the space. These cyphers are then translated into volumetric settings to amplify the existing events and spatial social interactions. The artefact is an anthology series of architectural scripts which consists of Urban Forum, Viewing and Vertex to reveals the narratives from the daily society. Urban Forum reveals the daily social interactions around the fountain and inhabits the events of street performance. Urban Viewing questions the sense of distance between our sights and body to highlights the visual connection of the Tio Pepe and Schweppes neon signs landmarks. Urban Vertex indicates the encounters within the busiest corner of the city and the street vending scene in Sol. What texts did you use as inspiration and reference? Why? 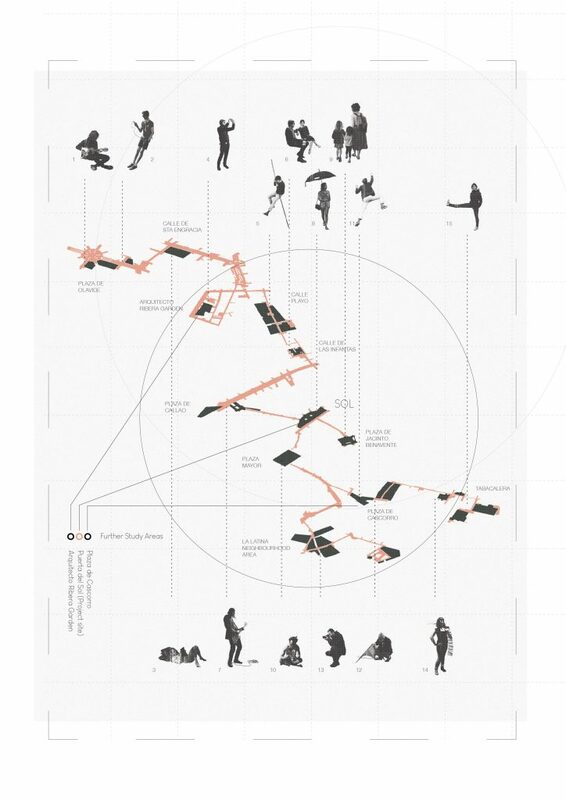 Tschumi’s theory of programmatic sequence and his idea about the relationship of space, event and movement, has reshaped the mindset of spatial connections and the use of architectural language in this project. The use of storyboard in architectural design allows us to direct something more than physical incidents within our architecture, yet the ambience, perception and emotion that it inhabits. How and to what extent has this thesis influences how you operate as an architect? The project inspires the philosophical thinking of architecture that beyond the physical settings and redirects our gazes back to ourselves and the society. It reveals the memories and stories within an isolated society, that provokes the meaningful information from objects, in an attempt to bridge social relationships through a mutual aid of commonly shared memories and the realisation that imperfection is accepted. As gentrification dilutes our local culture, the study suggests an interpretable urban development solution to respond to our needs. What scale are you interested in? 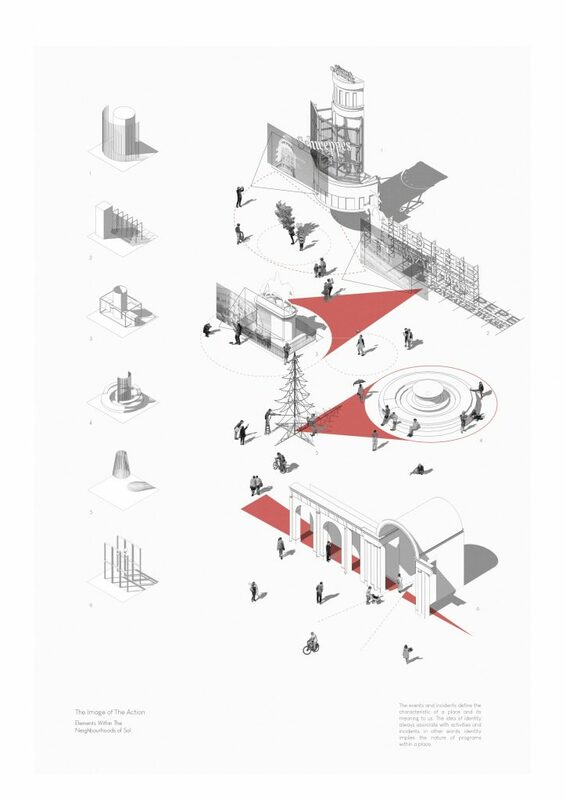 The thesis is an urban movement yet contributed by a series of discontinuous structures with a focal view of the factions of the very tiny or invisible elements within spaces. The direction of study reflects my best interests in the philosophical aspect of architectural studies. Indeed, if the nature of space is interpretation, architecture shall follow fiction.